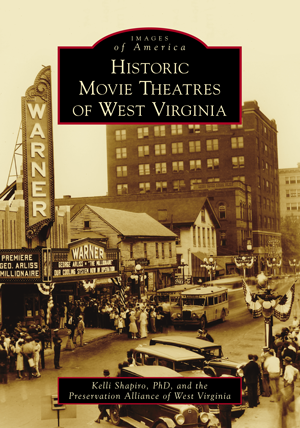 "The Evolution of the West Virginia Movie Theatre"
Learn more about the lecture series and new book by listening to Dr. Kelli Shapiro's interview with MetroNews in April 2019. 4/13/2019, 3pm: Culture Center’s Archives & History Library (Charleston). ​4/27/2019, 10am to 4pm: Main Street Martinsburg’s Chocolate Festival and Book Faire (Martinsburg). No lecture; book signing only. 5/8/2019, 7pm: Morgantown Public Library’s Aull Center (Morgantown). 5/10/2019, time TBA: Granada Theatre - including lecture, signing, and a tour of the closed picture palace. Event put on by Craft Memorial Library / Eastern Regional Coal Archives (Bluefield). 5/11/2019, 2pm: Alban Arts Center during the St. Albans Founders Day celebration (St. Albans). 7/13/2019, 10am to 3pm: Clarksburg-Harrison County Public Library’s Author Forum (Clarksburg). No lecture; book signing only. 10/4& 10/5/2019: West Virginia Book Festival at Charleston Civic Center (Charleston). No lecture; book signing only. • More locations and dates TBA. If you are interested in setting up a free lecture & signing at your museum, library, organization, etc., please contact Kelli Shapiro at preservewv@aol.com.